The emu father had many chicks, but that poor old bush turkey only had one child. When the bush turkey came by he saw that the emu was sitting all alone and asked ‘where are all the children?’ ‘I didn’t want all them children, they are too much trouble. So I killed them all!’ The emu hadn’t really killed his children, but hidden them in the bush. When the turkey’s son heard this he said to his father ‘If you don’t kill me I’ll show you where all the tucker is.’ But the turkey killed him. While the turkey was sitting down at Kanpi he saw the emu come back with all his children. He realised he’d been tricked. He told the emu to grab his spear thrower. He hit him in the chest and finished him. When he got back to Kanpi rockhole all the emu kids were painted up for Inma (sacred dancing). The kipara hid behind a tree and whistled at them. He was frightening them and they thought he was mamu (devil spirit). They ran off down towards Watarru. This is the true story for Kanpi. I was born with the mark where the kipara hit the emu on my chest. I am the emu. Kanpi is my place. 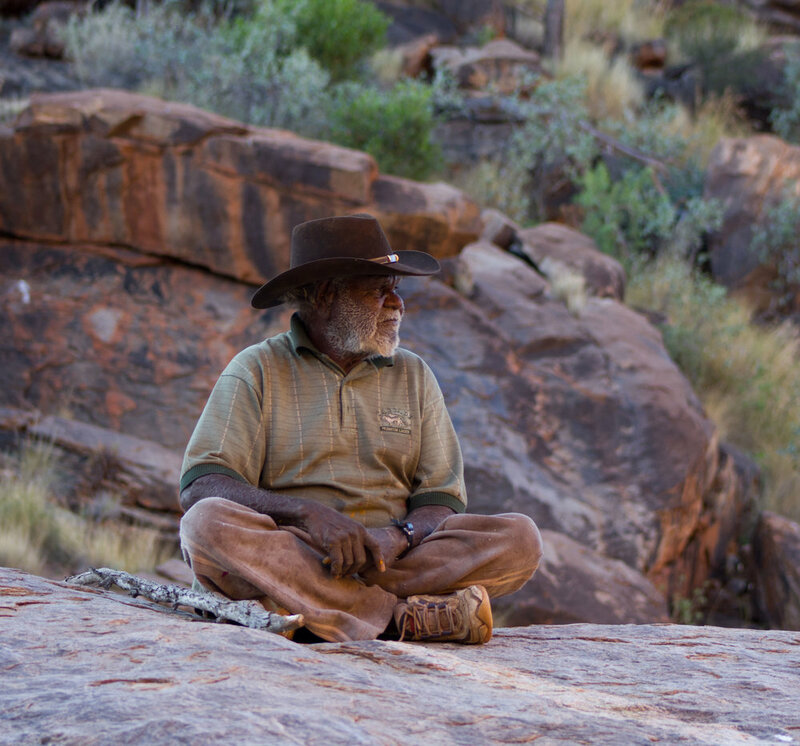 Kunmanara (Jimmy) Baker was born along the Kalaya Tjukurpa (Emu Dreaming) track in the Western Desert. After the mission days his family established of a homeland community at Kanpi so they could live in their own country. Jimmy was a senior law man and a highly regarded Ngangkari (traditional healer). Like other senior men, he painted stories that clearly define significant sites or paths etched into the landscape by ancestral beings. These sites are multi layered, with physical, geographical, spiritual and ceremonial connotations.